The Plating Montipora Coral, is great looking and easy to care, but it can get big! The Plating Montipora Coral Montipora peltiformis is an attractive plate Montipora. It typically grows in colonies of thin plates or scrolling shapes, while attaching an encrusting base on rock. Rather than forming upright branches it has upright nodules on the surface, giving it a textured appearance. Hence one of its common names is Rice Coral. Like other plating varieties of Montiporas, it is fast growing but with its light weigh skeletal structure it easy to frag. The M. peltiformis is usually gold or green topped with purple or blue polyps. The edge or margin will sometimes be a lighter pink or purple. In the wild this species of coral has different growth forms at different water depths. Deep water colonies can have massive plates or whorl shapes that overlap in tiers, with individuals being up to a 3 feet (1 m) across. Those from shallower more turbid waters have extensive horizontal plates with a rougher surface. Colonies can form large continuous coral beds. A very attractive small polyp stony (SPS) coral, the Plating Montipora Coral makes a great showpiece in a reef tank. It is moderate to easy to care for, accepts a wide range of lighting, and is very peaceful. They are also less likely to bleach or get the diseases that the Acropora corals tend to get. The Plating Montipora Coral is a fast growing Montipora, so it does need a roomy tank in which to expand. It's a great variety to fill in those areas where a branching coral may not work. Keeping this coral trimmed back is necessary. Yet this can be positive thing as selling the pieces to other aquarists helps to preserve the wild population. These Montipora can be quite dominating in a tank, yet their beauty makes it easy for one to make allowances for the rapid growth of connecting plates. Distribution / Background Montipora Coral Information: The Plating Montipora Coral Montipora peltiformis was described by Bernard in 1897. Some common names they are known for are Rice Coral, Scrolling Montipora Coral, Plate Montipora, and Plated Coral. Aquacultured specimens are often described by their color, such as Blue Polyp Scrolling Montipora Coral, Purple Polyp Plating Montipora Coral, or Light Yellow with Purple Polyps. Where Montipora Corals Are Found: M. peltiformis are found from Madagascar to Australia, including the Great Barrier Reef. It is also found in the Philippines, the Coral sea, Flinders Reef, and the Houtman Abrolhos Islands. Montipora Coral Habitat: M. peltiformis are generally found on shallow reef slopes, but can also be found in deep water. It has different growth forms at different water depths. At times reefs can be made up of massive colonies of this particular Montipora species, thus underscoring the need for a larger tank in captivity. Montipora, as a species, are found from deep water (greater than 10 meters / 33 feet) to the reef crest and from clear oceanic reefs to turbid (not clear because of stirred-up sediment, etc.) lagoons. Even though their range is large, Montipora are more likely to be found in quiet water at mid-depths. Status The Montipora peltiformis is not on the IUCN Red List for Endangered Species. Description What do Montipora Corals look like: The Montipora Spp. corals have very porous and lightweight skeletons. 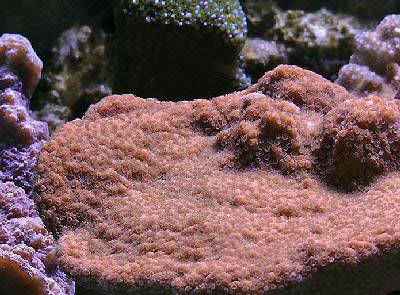 The Montipora peltiformis are a plating species of small polyp stony (SPS) corals. It grows in colonies of thin plates or scrolling shapes, while attaching an encrusting base on rock. Rather than forming upright branches it has upright nodules on the surface, giving it a textured appearance. The colors of the Plating Montipora Coral are usually gold or green topped with purple or deep blue polyps. The edge or margin, where there is new growth, will sometimes be a lighter pink or purple. Captive varieties can have even more color variation due to cultivators bringing out these desirable hues. Difficulty of Care Montipora Coral Care: The M. peltiformis is easy to moderate to care for, accepting a wide range of lighting. They must be placed so they have room to grow because, under the right lighting, they are a fast-growing species. Unlike Acropora, which are in the same family, Montipora corals do not stress as easily and are more resistant to bleaching and disease. Some credit this resistance to their deep-set polyps.They are easy to propagate as well. Wild caught specimens do not do as well in captivity as aquacultured ones. A well-feed live rock/reef environment is what is needed for your Plating Montipora Coral, along with some fish for organic matter production. These corals are usually hardy and fast-growing, however a mature tank is recommended. In general, if your M. peltiformis has any kind of tissue recession, just cut off the healthy part. Just make sure you cut into some of the healthy part also, to be sure there is no disease encroaching on the healthy tissue. Also, keep out the cyanobacteria and algae with good water movement, and your Monti will stay happy. Availability Montipora Corals for Sale: The Plating Montipora Coral M. peltiformis is easy to find at pet shops and on line. Online they can run about $29.00 USD or more depending on size.